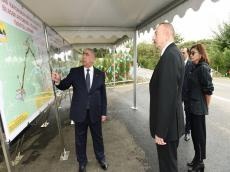 President of the Republic of Azerbaijan Ilham Aliyev and First Lady Mehriban Aliyeva have attended the opening of the Hirkan-Dashtatuk-Bilasar highway as part of their visit to Lankaran. The highway was reconstructed by Azeravtoyol Open Joint Stock Company. Chairman of Azeravtoyol Open Joint Stock Company Saleh Mammadov informed the president and first lady of the characteristics of the highway. The 22km-long road connects 23 settlements. The two-lane road is 6 meters in width. President Aliyev and First Lady Mehriban Aliyeva cut the ribbon symbolizing the opening of the Hirkan-Dashtatuk-Bilasar highway.